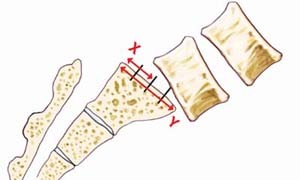 A spondylolisthesis occurs when one vertebral body slips forward over the one beneath. There are two types: degenerative spondylolisthesis and isthmic spondylolisthesis. Most patients with a spondylolisthesis respond well to non-operative treatment, such as medication, physical therapy, and spinal injection therapies. When to consider surgery for spondylolisthesis? Pain and symptoms cannot be non-surgically managed. Bowel or bladder dysfunction develops. Your neurosurgeon may recommend a minimally invasive spine surgical (MISS) procedure instead of traditional spine surgery. The goals of either MISS or traditional spondylolisthesis surgery include: reduce nerve compression (this is called decompression) and stabilize the lumbar spine. Spinal fusion and instrumentation are performed to stop the vertebral body from sliding further forward and holds the spine in place while you heal (vertebral bodies fuse together). slipped forward over the top of the sacrum (S1). Well in advance of your surgery day, your neurosurgeon explains how he performs your procedure. During the discussion, you learn if your procedure can be performed as a minimally invasive spine surgery or open approach, and why. Before surgery, you visit your primary care doctor and/or other medical specialists (ie, heart doctor, endocrinologist) to obtain a general health clearance. This means your doctor has carefully evaluated your health in terms of undergoing surgery. Your assessment may include blood tests, x-rays or other imaging studies, as well as special tests for existing medical problems (i.e., diabetes, osteoporosis). Of course, the potential benefits of the surgery are important to know, but so are the possible risks and complications. Your risks and complications may be different from those of another patient because you are unique. Your neurosurgeon takes that into serious consideration and thoughtfully explains potential risks to you, which may include infection, bleeding, reaction to anesthesia, and nerve damage. You are moved from the operating room into the recovery area. Here, the nurses and medical staff closely monitor your vital signs with attention to managing post-operative pain. You should expect some discomfort. Your surgery is over, but now your recovery starts! If you do not understand your post-surgical instructions or a problem develops, please call us—we are here to help you. Schedule your post-operative appointment (call 281.446.3876). If your doctor prescribes a lumbar brace, wear it as prescribed. Keep your incision(s) dry and clean. If showering is permitted, keep your incision(s) covered and dry. Rest; you will fatigue easily while your body heals. Do not take a tub bath, go swimming, or sit in a hot tub or pool. Begin physical therapy and/or exercise as instructed. Do not lift or carry anything heavier than a shoe. Do not drive until cleared by your neurosurgeon. Avoid riding in a car; short distances are permitted. Eat well, your body needs nutritious food to heal. Fever 101 degrees Fahrenheit or higher. Redness and/or swelling around the incision site expands. Change in the amount, odor or appearance of the incision drainage. We hope this information about spondylolisthesis surgery has answered your immediate questions. Remember, your neurosurgeon is your most valuable source to answer your questions about symptoms, treatment and your healthcare.